There are several variants of Draw Poker, including Badugi, California Lowball, and Deuce- To-Seven Low. The most popular variant, by far, is Five Card Draw, the game most people learn to play as children. The rules are simple (we’ll give you a 3-minute refresher course in a moment) and the game is fun to play. What’s more, it is offered by most top-rated online poker rooms. It’s worth mentioning that none of the big-brand poker sites currently provide a no download Draw Poker option; you’ll need to download the site’s poker software in order to play the game. On this page, we’ll focus on 5 Card Draw Poker since it is the variant most people know and love. We’ll explain how to play Draw Poker, and offer a few suggestions for building your chip stack. In 5-Card Draw games, there are two betting rounds separated by a draw. Each hand begins with a posting of the blinds. Then, five cards are dealt face-down, one at a time, to each player. Once all players have received their hole cards, the first round of betting begins. After the last active player bets, there is a draw. Each player can choose to discard up to five of their hole cards, exchanging them for new cards from the deck. You can also choose to keep your original five cards, rather than exchanging them. Once every player has received their draw cards (assuming they chose to discard any of their hole cards), the second round of betting begins. At the end of this betting round, all remaining players go to a showdown. Each player reveals his or her hand, and the highest-ranking hand wins the pot. If two or more people have the same high-ranking hand, the pot is split between them. Draw Poker is a simpler game than Texas Hold’em or Omaha. But that doesn’t mean strategy is optional. It is, in fact, critical. Your strategy for online Draw Poker should follow the same principles as for holdem. First, know your starting hands, and recognize how your position at the table affects them. For example, if you’re under the gun, a pair of Kings is a good lead-off. If you’re in a middle position, lower pairs are usually safe as long as no one has raised. Also, when you’re in an early position, don’t be afraid to be aggressive if you’re holding a suitable starting hand. This can be an effective way to drive other players out. Be careful, though. An aggressive move can backfire if your opponent is holding something better than just a drawing hand. Watch what happens at the draw. If someone only takes a single card, there’s a good chance their hand is already made, and they’re trying to improve it before the showdown. If, on the other hand, they’re drawing four cards, they’re likely throwing a Hail Mary. Lastly, keep your odds in mind (just as you would while playing Texas Hold’em). For example, if you’re holding a 4h-7h-9h-Jh, know what your odds are to hit your flush. Same with trips, straights, and any other strong hand you can take to the showdown. Calculating odds seems difficult, but it comes more easily with practice. One last important note: you might be a great bluffer in holdem, and use your skill to catch your opponents off-guard. With online Draw Poker, bluffing isn’t nearly as effective since you have less room to maneuver. Keep this in mind. Even though none of the top-ranked poker sites currently provide a no download Draw Poker game, it is still worth playing. It’s simple, fun, and if you know what you’re doing, can be an easy method for building your bankroll. 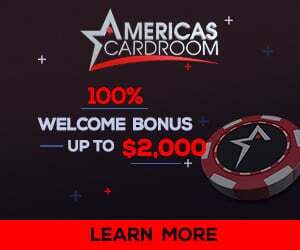 The following online poker rooms not only offer Draw Poker games, but also a host of other features that provide an engaging playing experience. There’s a good chance you already know how to play Five Card Draw and other Draw Poker variants. Take a few minutes to visit the poker room above and register your accounts. Download their software and get some practice before jumping into the cash games.